Pet Hug Pack® therapy teams make daily visits providing social, motivational, educational, or health benefits for people during interactions. Your gift supports these important interactions, bringing comfort and unconditional love to people in need. 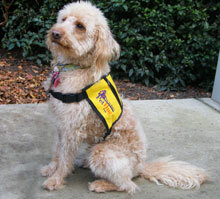 To donate by mail, send your check to ARF, 2890 Mitchell Drive, Walnut Creek, CA, 94598. For questions, please call 925.256.1273. If you donate and have not already registered, you will receive periodic updates and communications from Tony La Russa's Animal Rescue Foundation. ARF has received Charity Navigator's highest 4-star rating for 11 years running.